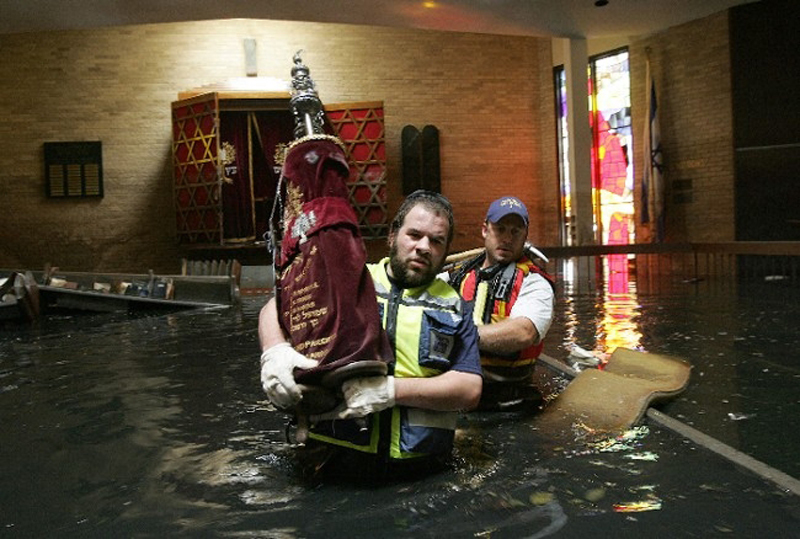 Seven years ago an iconic picture for many Jews of the devastation wrought by Hurricane Katrina was of men waist deep in a flooded synagogue carrying Torahs to safety. On August 26, in a celebration of physical and spiritual unity, the Torahs of that congregation were carried into their new home next to the Reform congregation that offered space to the Modern Orthodox synagogue and now shares with it a new playground. Seven years after the hurricane hit the region on Aug. 29, 2005, and the subsequent failure of levees devastated much of Greater New Orleans, Beth Israel opened in a new home in Metairie, a suburb five miles from its former home in New Orleans. The August 26 dedication ceremonies symbolised the rejuvenation of the area’s Jewish community. Some 2,000 young adults have moved to the region in recent years. Holly Pollack, 28, is among them. In 2008, the native of nearby Baton Rouge returned to the area with her husband because she thought that she had a responsibility to help rebuild. Pollack is excited to be part of the reopening of Beth Israel, the only synagogue that was completely destroyed during the hurricane. Pollack and the other young Jewish professionals returning to or new to the area were aided by the Jewish Newcomers Program, an initiative of the Jewish Federation of Greater New Orleans designed to lure newcomers. The New Orleans area currently has about 9,500 Jews, Weil says. The community had about 13,000 people the year before the storm, according to the 2004 American Jewish Yearbook. National Jewish groups helped sustain the community after the hurricane. The United Jewish Communities, now the Jewish Federations of North America, coordinated a national campaign that raised $28 million for Katrina relief in the Jewish and general communities of Baton Rouge, Biloxi and New Orleans. Likewise, many Jewish groups sent volunteers to the area to help clean up and rebuild homes. Also, the Rabbinical Council of America, Yeshiva University and the Orthodox Union launched a joint online fundraising campaign for Beth Israel that raised more than $400,000. The Jewish Newcomers Program, Weil says, offers social, professional, financial and membership incentives, including free one-year memberships to the Jewish community center, any area synagogue, the National Council of Jewish Women and Hadassah. At Beth Israel, it’s made a difference. Its gabbai, Irwin Lachoff, says that prior to Katrina, the congregation had struggled to get the required 10 men for a Shabbat morning service. Today the services draw 40 to 50 worshipers. When the canals broke, they left Beth Israel’s former building in 10 feet of water. Seven of its Torah scrolls, thousands of prayer books and other items were destroyed. “When we came back, we started to clean out and salvage the things we could and very soon we stopped crying and started working hard,” says Jackie Gothard, 78, a fifth-generation member and one of the congregation’s past presidents. “We got over the initial hurt and realized that we lost our synagogue, but it was only a building. It wasn’t our people. Immediately after Katrina, the Reform temple Gates of Prayer offered Beth Israel a temporary home. “It was important to us when the storm hit that Congregation Beth Israel not go out of existence because it’s important for a community like us to have all the major expressions of Jewish life in order to be a Jewish community,” explains Gates of Prayer’s Rabbi Robert Lowey. For nearly seven years, Beth Israel held weekly services in the Gates of Prayer chapel and leased office space in the building. When it came time to rebuild, Beth Israel decided to buy land next to the Reform synagogue. The dedication ceremony for Beth Israel started at Gates of Prayer, then had a procession to the new building with five Torahs donated by families throughout the country. Adorning the outside of the new building are two biblical quotes: “Mighty Waters Cannot Extinguish Our Love” and “Build for Me a Sanctuary and I will dwell amongst you,” the latter of which was lifted from the front of the old synagogue. And while grateful for the hospitality of Gates of Prayer, Beth Israel congregant Hilton Title is excited to be able to worship in his own congregation’s building.